For the third year in a row the Hollywood Foreign Press Association was applauded at the annual Noir City, the San Francisco noir film festival, for its support of the restoration of endangered noir films. The 14th edition of Noir City, currently under way in San Francisco, has an added international flavor: the film restored with HFPA support, Los tallos amargos (The Bitter Stems) is not a USA noir, but an Argentinian classic, the 1956 winner of the Silver Condor award for best feature, given by the Argentinian Film Critics Association. The North American premiere of the restored movie took place in a sold out gala performance at the historic Castro theater, a 1400 seat 1920s movie palace. Eddie Muller, the founder and president of the Film Noir Foundation told the audience: "Once again we are able to unveil a rescued and restored film, long mired in cinematic obscurity, the brilliant 1956 Argentine noir Los tallos amargos, which we are proud to present in a new 35mm print, making it s North American debut here at the Castro theater. I was so determined the minute I saw this film, while visiting a movie collector in Buenos Aires, that this magnificent movie has to be rescued. We had to find a way to restore it, and we did. But it took some help, and one of the organizations that provided that help was the HFPA through their grants program." Representing the HFPA, member Yoram Kahana joined Muller on stage and told the cheering audience that last year's restoration, also fully funded by the HFPA, Woman on the Run (1950), was invited to the Film Restoration Festival in Bologna, Italy, where it played twice to a sold-out house, with the audience munching on popcorn and soda, also courtesy of the HFPA, because, he said," you cannot properly show a 1950's American nail biter noir without popcorn". Los tallos amargos is based on a novel by journalist Adolfo Jasca, winner of the Emece Literary Prize, Argentina's highest literary honor. It tells the story of a Buenos Aires journalist, down on his luck, who creates a moneymaking scam with a Hungarian immigrant: a sham journalism correspondence school. As the money flows in, the partners have a falling out, and the journalist commits the perfect murder, that turns out to be not so perfect after all, with tragic consequences. The film was scored by Astor Piazzola, the greatest Argentine composer of the 20th century, who revolutionized traditional tango music by incorporating jazz and classical elements. The black and white cinematography was included in the 100 Best Photographed Films of All Time, a list compiled by American Cinematographer magazine. Ricardo Younis, the cinematographer, was a student of the legendary Gregg Toland, who was in first place on the magazine's list, for his work on Orson Welles's Citizen Kane (1943). Over the years, Los Tallos Amargos was almost lost. In late 2014, a leading Argentine cineaste and collector found the original negative in a private cache of films stored in a Buenos Aires private home. It was a race against time to restore the film before it deteriorates, and the FNF entrusted the work to the UCLA Film & Television Archive's restoration lab, where the negative was rescued and restored in a 35mm format, and a digital soundtrack was also crafted. As they do every year, the FNF will take the Noir City show on the road across the nation, and the HFPA supported restoration will anchor each festival. First stop will be Hollywood, April 15- 24 at the historic Egyptian Theater in Hollywood. 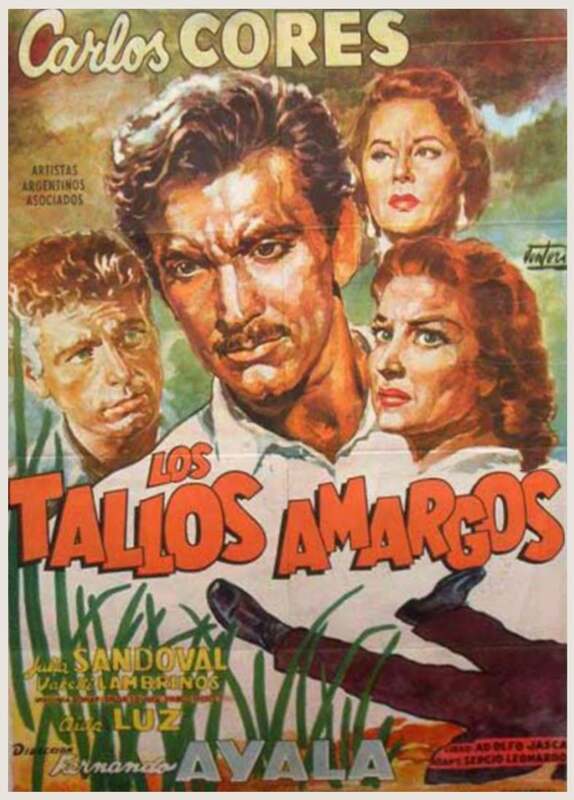 You will have a chance to see Los tallos amargos, saved and the gloriously restored with the help of the HFPA.